Although philodendron (Philodendron spp.) plants cover a genus of more than 200 species, they are neatly categorized as climbing (vining) or non-climbing (upright) types. Regardless of their growth type, philodendrons require similar care, which places them in the coveted category of suitable for even novice gardeners. A philodendrun bearing white fruit. Native to tropical and rainforest climates, philodendron is not a drought-tolerant plant. During the growing season, water thoroughly when the soil is barely dry to the touch -- enough to soak the root ball, but not so much that the soil becomes soggy. Excess water should drain freely. In the winter, when philodendron's growth slows or stops briefly, water only enough to keep the soil barely moist. Philodendron prospers in a humid atmosphere, particularly in dry homes, which you can provide by setting pots on top of pebbles in water-filled trays. Atypical of many foliage plants, philodendron is a heavy feeder. Some philodendron plants seem to thrive on neglect without any fertilizer, but most plants perform best on a regular fertilizer regimen. 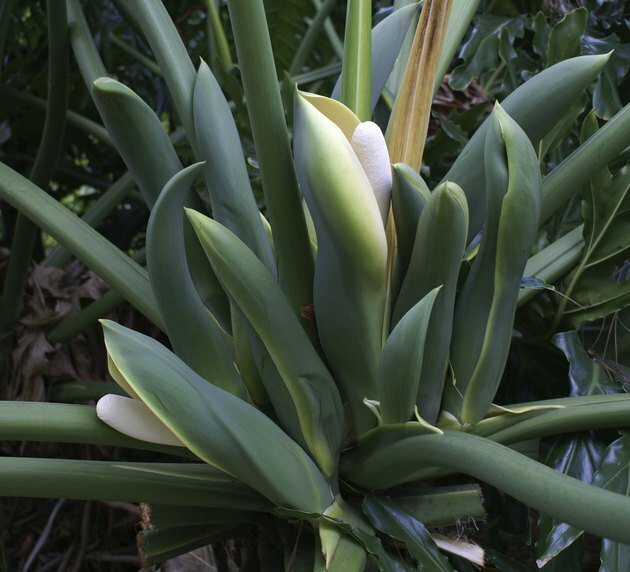 Because any flowers the plants may produce are subordinate to the leaves, which is philodendron's primary merit, using a high-nitrogen fertilizer promotes lush foliage growth. Look for a 24-8-16 premixed formulation, or a water-soluble fertilizer that you dilute typically at the rate of 1/2 teaspoon per gallon of water, and apply every two weeks during the plant's growing season. Most philodendron species, such as heart-leaf philodendron (Philodendron scandens, formerly Philodendron cordatum) are perennials in U.S. Department of Agriculture plant hardiness zones 11 through 12, where they need temperatures above 65 degrees Fahrenheit to survive. One of the hardiest species, cut-leaf or tree philodendron (Philodendron bipinnatifidum, formerly Philodendron selloum), grows in USDA zones 9 through 11. Heart-leaf philodendron's vines may reach 20 feet whether it grows outside or indoors, and with its natural habit of dropping its lower leaves, the plants tend to become leggy. You can prune the vines to keep plants tidy, which also promotes new foliage growth and makes the plants bushier. Tree philodendron typically maintains a full, upright shape, but when the older leaves naturally wilt and turn yellow before they die, you can go ahead and prune them away. Disinfect all pruning tools by soaking them for five minutes in a solution of 1 part household pine-oil cleaner to 3 parts water, and rinse thoroughly with water before making any cuts. Philodendron is not generally bothered by pests. Occasionally, aphids, spider mites, mealybugs or scale insects may feed on plants, but the University of Florida recommends a chemical-free management strategy -- simply rinse the plants with water in a sink or shower to dislodge the pests. If philodendron is over- or under-watered or overfertilized, the leaf tips may turn brown. Because some species produce toxic chemicals, keep plants out of the reach of children and pets, and wear gloves when pruning.